3 or 6 Sweetie Pies, your choice. 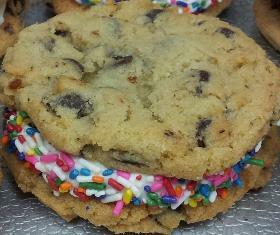 We take two of our Blue Chip Cookies and put our "Buttercream Icing" between them...The Blue Chip Sweetie Pie is SWEET. Blue Chip Sweetie Pies are a favorite at our stores, so customers were asking for us to put online. We take 2 cookies (same flavor), and put a layer of our Buttercream Icing between the 2 cookies! This is SWEET...hence SWEETIE PIES. We match the box wrapping to your message, so be sure to include one! Either send 3 or 6 to one address.